When the Space Needle pierced the Seattle skyline in 1962, it became (at 605 feet) the tallest building on the West Coast—wresting that title from the Smith Tower, which had held the lofty designation (at 489 feet) since opening on July 4, 1914. 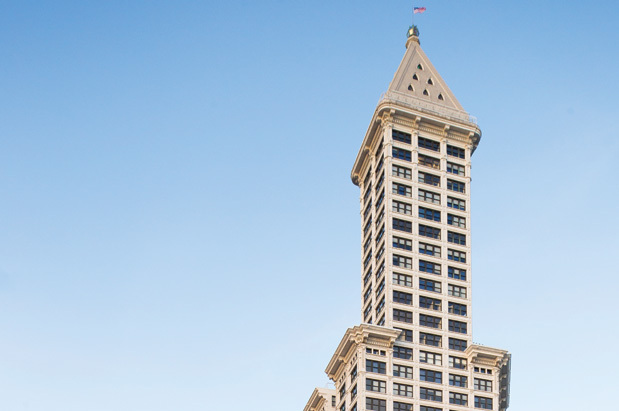 Until that wasp-waisted whippersnapper showed up, it was the Smith Tower that beckoned tourists to Seattle, with an astonishing 42 stories, an observation deck and the exotic Chinese Room. The two white architectural icons now stand at opposite ends of downtown (bookending many newer, shinier, taller buildings), the one at the north flamboyantly futuristic, and the one at the south stately, harking back to a more formal age. A dead ringer for New York City’s Metropolitan Life tower (1909), ours was built thanks to funding from shotgun and typewriter magnate Lyman Cornelius Smith. Its standout feature is a Gothic pyramid cap (currently a killer private apartment). Although it doesn’t make it onto as many postcards as the Needle, the building has stood sentry for a century, holding steady even through the 7.1 magnitude earthquake of 1949.